Creswick Cemetery | Business & Tourism Creswick Inc.
Creswick Cemetery is located north of the township on the Clunes Road, and the gates are open daily from 9.00am to 5.00pm. The Old Cemetery is in Drummond street to the south of Calembeen Park. It is fenced and has trees and shrubs along with a large rock that has a plaque and the names of those who were Trustees at the time of the cemetery being turned into a Pioneer Park. The new/current cemetery originated on 12 March 1869 when an area of twenty five acres, one rood, thirty three perches was temporarily reserved and gazetted. In August 1869 improvements to the cemetery meant an extension of several acres more ground to the south, and a substantial iron rail fence with a blue stone basement being erected along the south side. Originally the gate to the cemetery was at the beginning of the monumental section. A row of trees to the left that form an avenue along a track. This used to be the main road to the cemetery. There was also a sexton’s cottage on the site where a galvanised iron shed now stands. The long driveway has seen many changes over the years, originally it was planted with trees to form an avenue and after 1900 this was changed to lovely gardens the full length of the driveway. In 1909 a permanent memorial was erected in the centre of the cemetery to remember those who perished in the Australasian Mine Disaster of 1882. 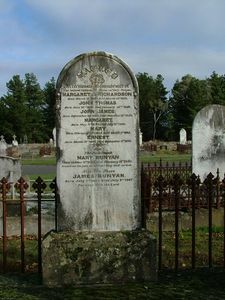 Of the 22 miners that died on that fateful day 19 are buried at Creswick, two in the Old Ballarat Cemetery and one in the New Ballarat Cemetery. Click here to read more about the history of the cemetery.